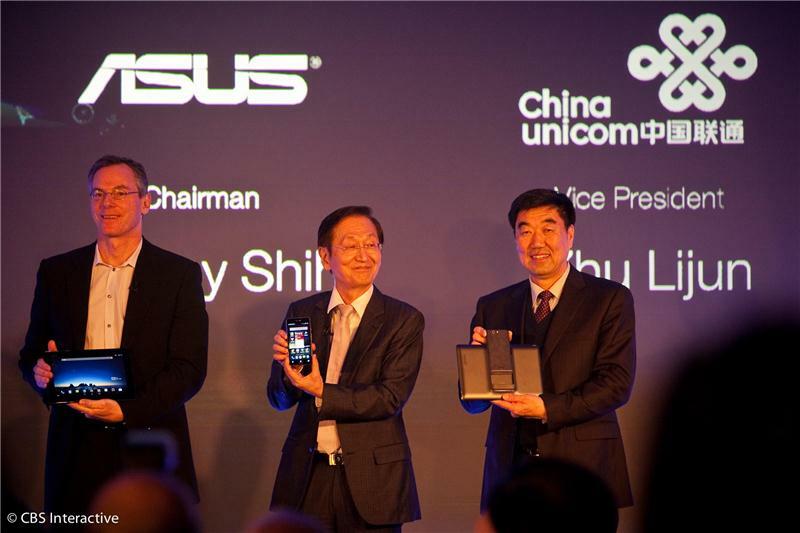 Asus is keeping quiet about its Mobile World Congress plans, but it could be the star of the show. Join CNET to find out. Some things you can do with the processor horsepower: real-time handwriting recognition, snappy photo cropping, voice input. It's got Asus Echo to click the phone's shutter remotely by saying "cheese." The supposed 'voice input' appeared on screen a shade before Shih had finished saying it. Ripple of laughter. Asus Echo also will tell you who's calling when you're driving so you don't have to futz with the phone while driving. It'll also wake you up with a human-voice alarm. "It is 7 a.m."
Someone clapped the 999 euro price, and was booed. A thousand Euros for a phone and a dumb screen? Jog on. "Technology should adapt to our lives, not the other way around. given fact that now you spend more time with your screens than you do making calls. We have already created a solution to this problem with the padfone. 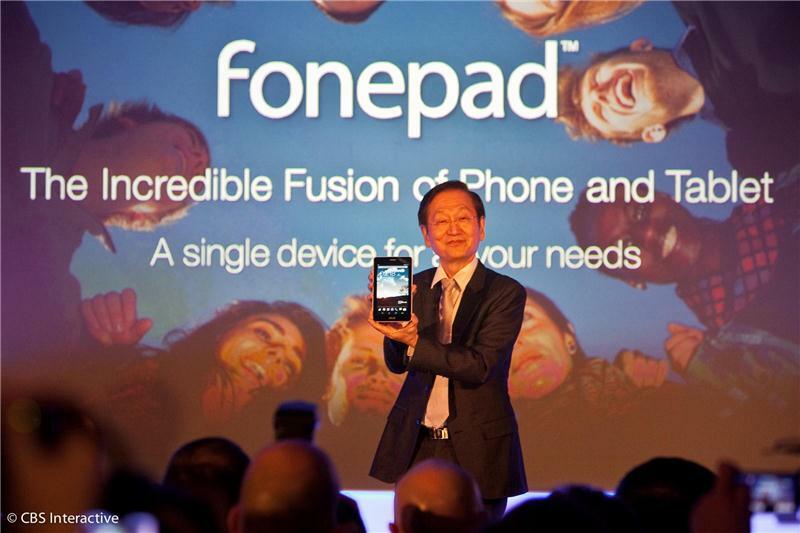 But for those who only want one device, I think the Fonepad is the perfect item." 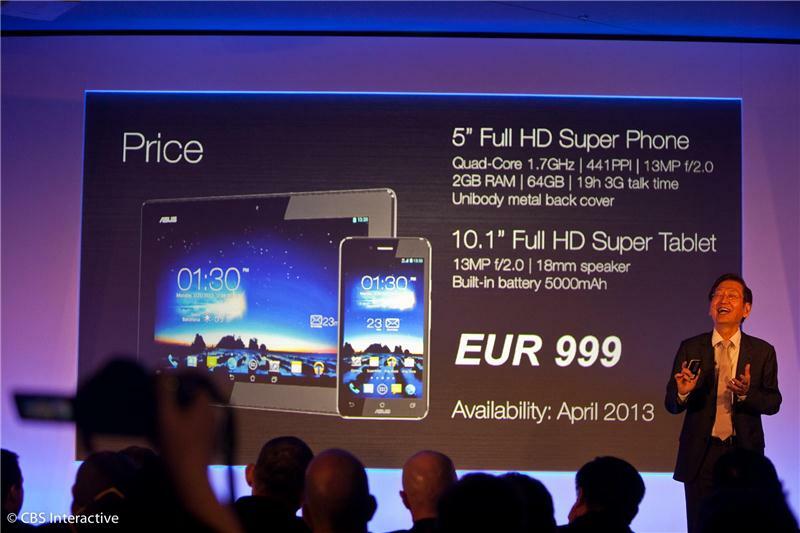 Unless phone networks have a word and sort out the price, this is going to be another PlayBook or TouchPad. €999 is $1,325 or £880. That seems... optimistic. "When the phone is also a tablet, you can maximize your entertainment experience. When a tablet is also a phone, you can enjoy full communication." 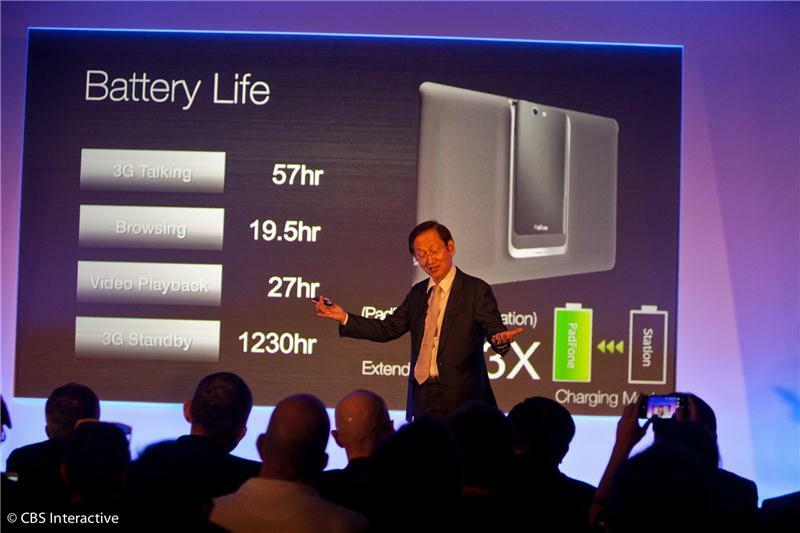 10 hours battery life on the Fonepad, according to the video. It's got an IPS display. 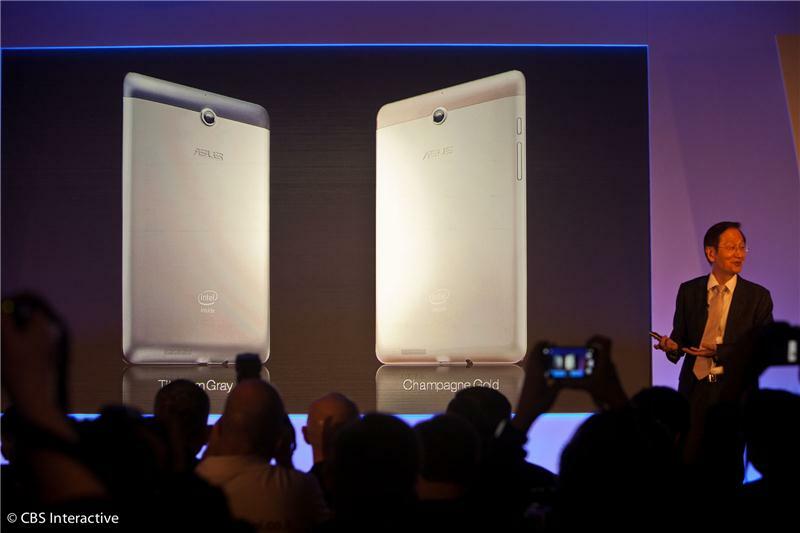 Asus lists reasons why a FonePad is a good idea: "One device is lighter than two. 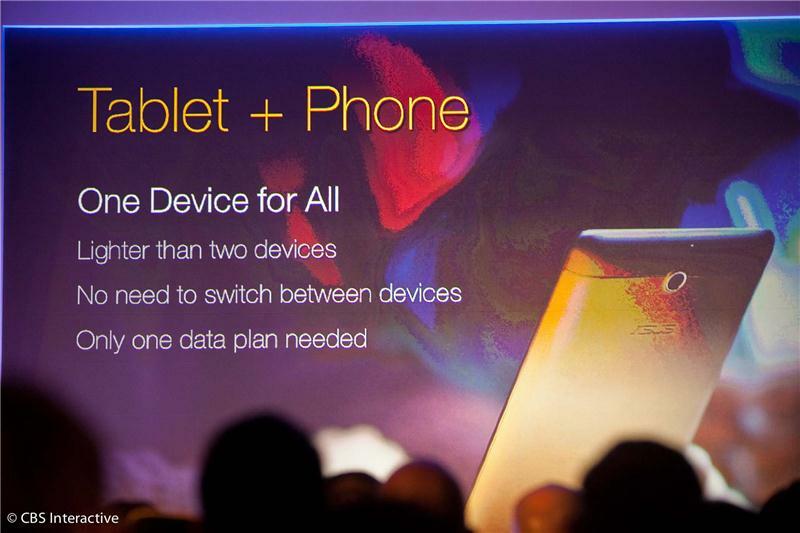 No need to switch between devices." 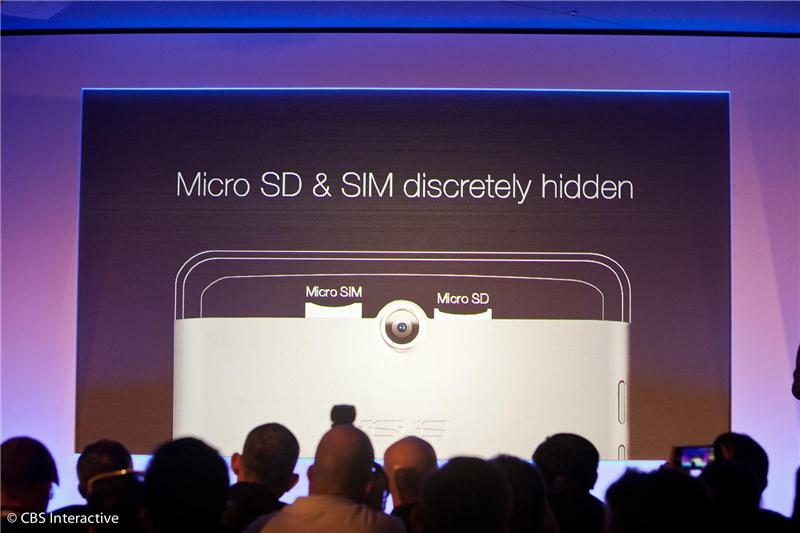 Er... didn't you just unveil two devices? Honestly, it was like two minutes ago. The Fonepad has a streamlined finish with a hidden compartment for SD card and SIM card. Two colors: gray and gold. Oops, that's titanium gray and champagne gold. Haven't they said something about OS? Android, Windows Phone or proprietary? It uses an Intel processor, too. That's unusual. 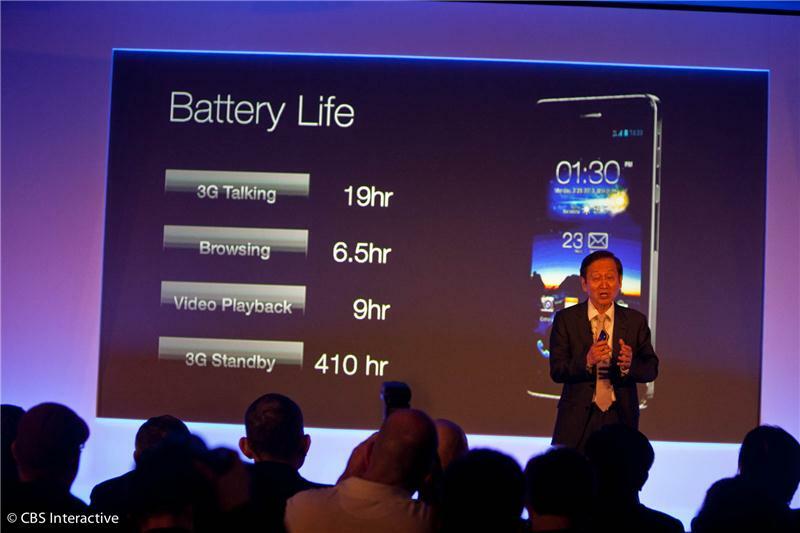 You can watch up to 9.8 hours of high definition video. That's about halfway through The Hobbit. The Fonepad has a 1.2MP front camera, 3MP rear camera, GPS, A-GPS and Glonass for navigation. For Asian market, starts from $249 with rear camera. 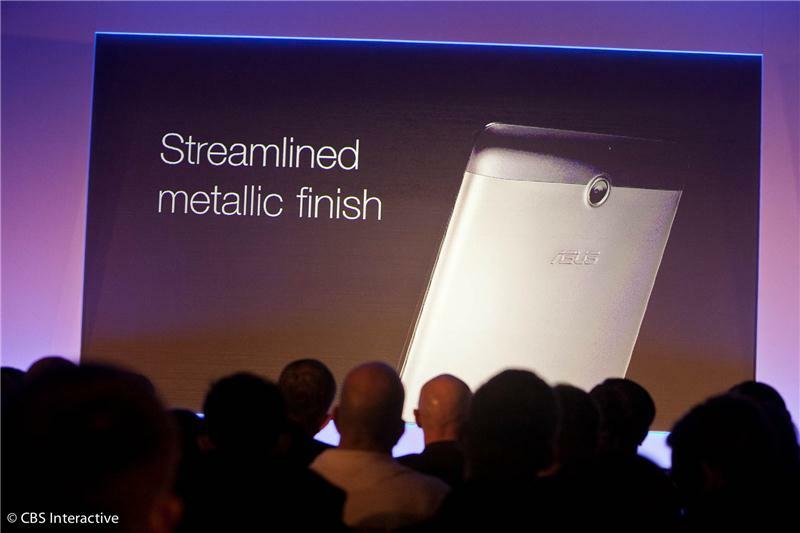 It'll be available in Asia in March. 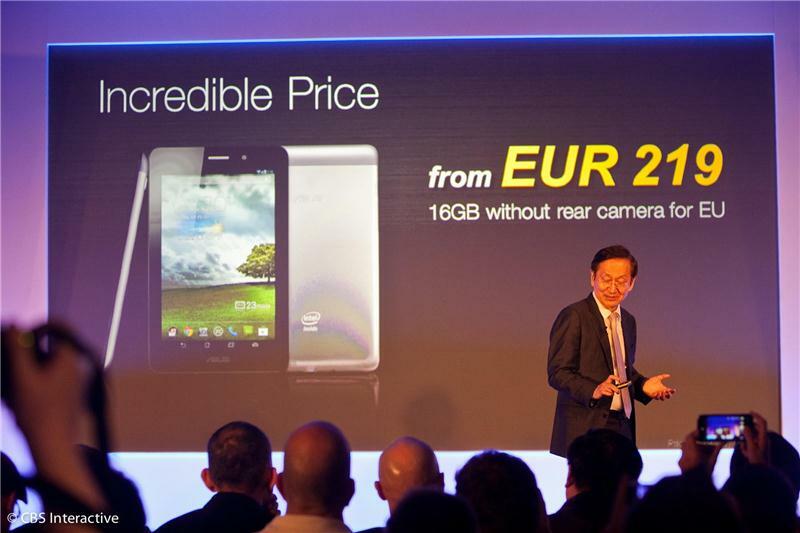 For Europe, it won't have a rear camera, and costs 219 euros, available in April. 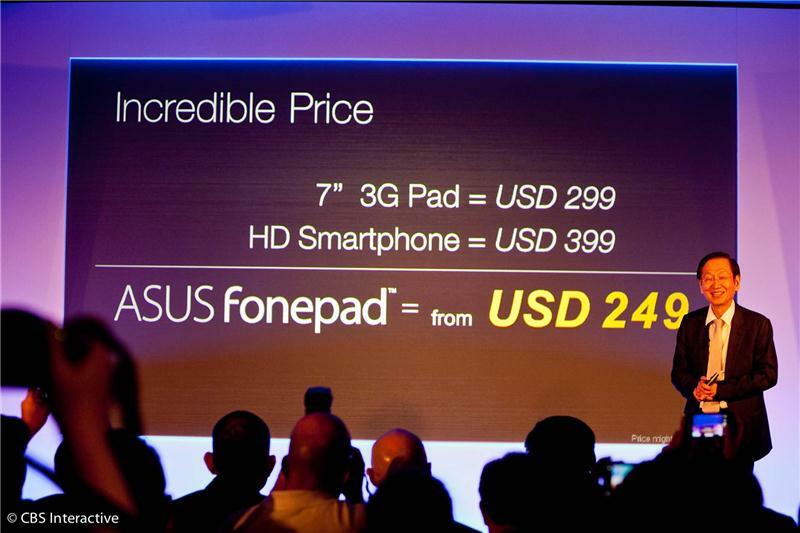 One extreme to the other -- from a thousand Euros for the Infinity to $249 for the FonePad. Maybe if man-purses caught on more in the U.S. we'd see more phablets there. €219 is just under £200, but that'll probably be plus tax. And that's a wrap for this press conference, folks. Thanks for all your comments everyone, sorry we couldn't use them all. Join us at 8am PT for ZTE! thanks guys for the live coverage! Man, 999 euros is still hard to swallow haha. Don't forget to check out our first takes, live now in the links above. Thanks!